The "Philosophizer" (a nickname I hate that just sort of stuck) in the envied spot on my writing desk. Crinkle paint makes these typewriters hard to photograph well. 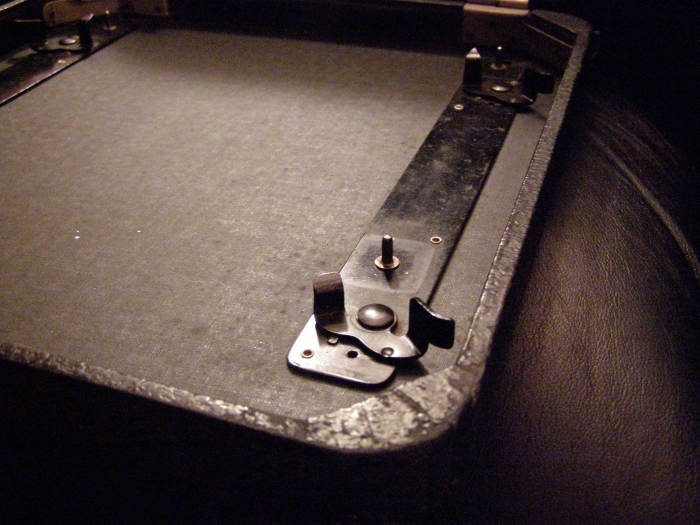 I love the reliable and simple latches at each corner of the case. I forsee a little bit of a rivalry between the Philosophizer and Frieta as each tries to win top spot in my heart. Nice! A real classic, and what a bargain. 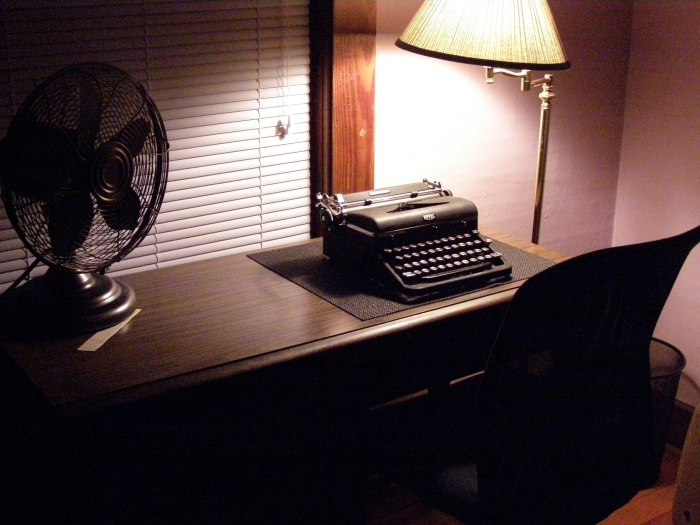 Your writing space looks so pure and clean, totally unlike my cluttered domain. I'll second Richard's comment. My space is quite a bit more chaotic. 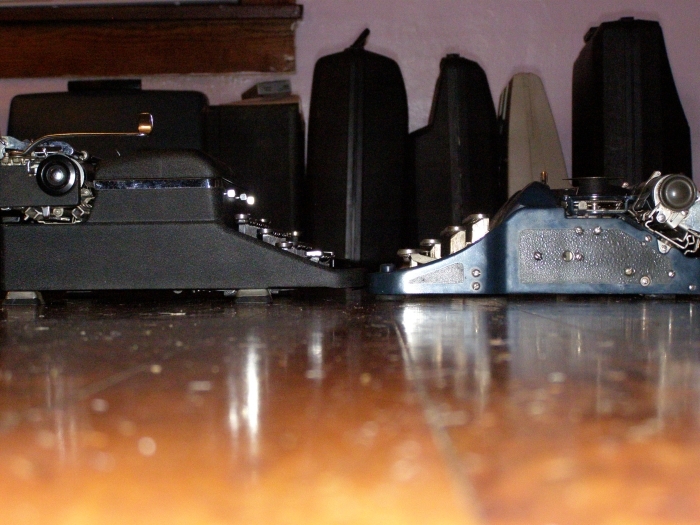 As for the favorite typewriter, that changes on a whim. At the moment, my favorite is the 1932 Royal with the Vogue typeface. The Topedo 18 with cursive type is a close second, but I haven't had time to play with it. A great machine that I own bus, alas, is broken. The key action on a Royal is something of beauty. Even up through the 70s the response was crisp. I'm more of a Smith Corona man, my favorite machine being my 1967 Classic 12.
very nice, and a good deal too. I have 50's aristocrats and they are excellent - better than the same-period QDL's I have. I really must get them out into the hands of writers. It is a very easy to use and easy to work with machine. It would be an excellent first typewriter for anyone. Good for you. 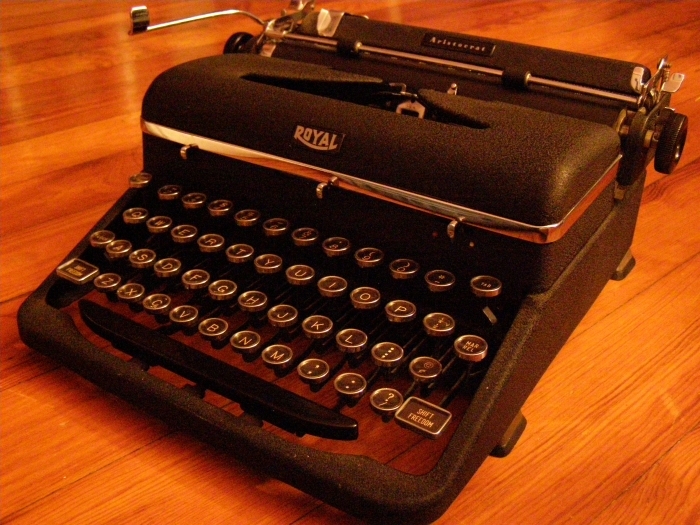 Cheap Craig's List typers are the best, and that is actually where I acquired one of my all time favorite machines; my Imperial Good Companion 1. Nice to see that someone has put that Royal to good use. 40s QDLs are really great typewriters. I love them too. Congrats on your find. I have two circa 1947 QDLs and they are by far my favourite machines to write with. Like yours, the left alignment on mine is a hit-and-miss affair, and my one also tends to join two words together from time to time (something to do with the space bar, perhaps? ), but they are such cool looking machines. Sounds like you got yours at a phenomenal price too. Congrats! I actually don't have any problems with this machine at all. Sometimes, and I mean once a page maybe, it will skip. The one with the margin problem is my Royal KHM which I blogged more recently (I think September 3rd, maybe 2nd). A typewriter tale to remember. I am officially putting a Royal Aristocrat on my TypeWatch list. My curiosity is spiked. My current favorite portable, that seems to change quarterly, is my Remington Streamliner (5). I look forward to the day when a current or yet found will find a more permanent home in the heart. It's quite different than the Remington, but definitely one to try.